Looking at all the pictures of Parillas racing in the 50s & 60s it is hard to resist the lure of replicating such a machine. As mentioned elsewhere on this site building a race replica has become the ideal method for the less scrupulous to turn an incomplete Turismo into a race winning MSDS. A triumph of imagination over integrity. Long before I started writing the website I started collecting parts to construct a trackday 250. 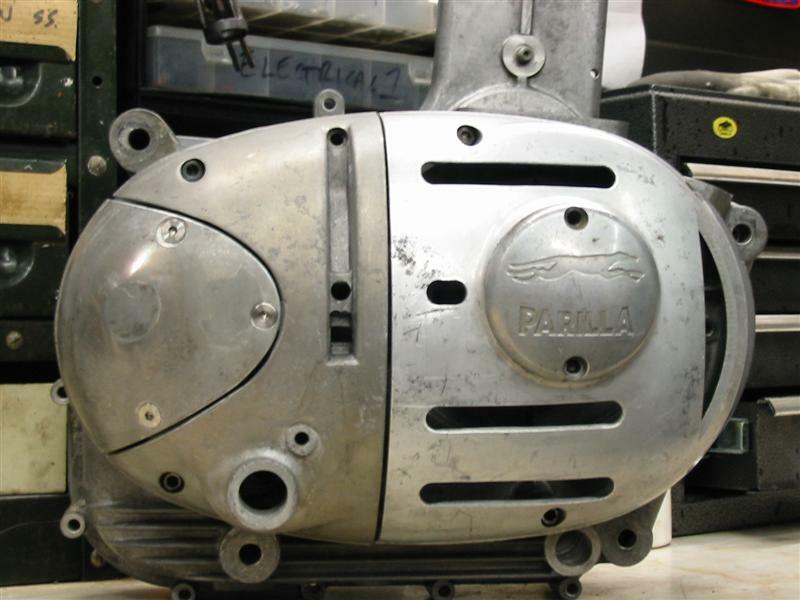 Not a replica of any particular model Parilla made, just a collection of suitable period parts (ideally mostly Parilla) which would go together to form a track suitable race bike. That was the plan until our UK Parilla GP rider came on the scene. 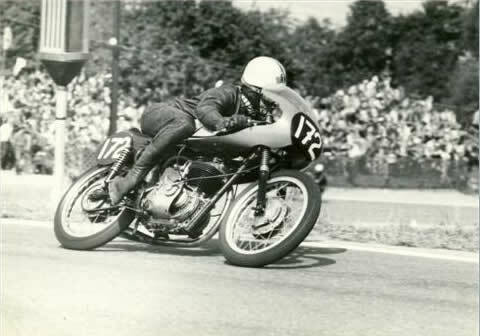 Armed with some great period pictures & a good memory he is currently serialising his ’64 race season on the site. The shot that got me thinking…One shot in particular fired my imagination. Quite a nice action shot showing good details of the bikes construction. Talking to Richard it became obvious that he would have changed certain aspects of the bike for the ’65 season had Parilla not ceased to be. My trackday bike now had a new direction – why not focus on a reconstruction of his ’64 bike (now to be known as the RM06 replica ) using the development lessons learnt during that season to make it even more effective. So this is the start of the project…..but where do we start? The engine ? The frame? In my case the frame. Some may decide otherwise but I’m of the opinion that a 250 has to handle well, excess power is never going to be a problem but a frame that ties itself in knots on heavy braking or snakes at high speed is! In RMs ’64 season he noted some problems with frame flex under braking…..& a lack of brakes as well! Not a great combination & a definite area we can improve on. In my experience with my MSDS 175 I found its steep head angle gave a rather uncertain, nervous feel at low speeds & a very uncertain, very nervous feel at speed. I suspected a frame repair in the ’60s, which involved the grafting of another headstock to the standard frame, might have been to blame. 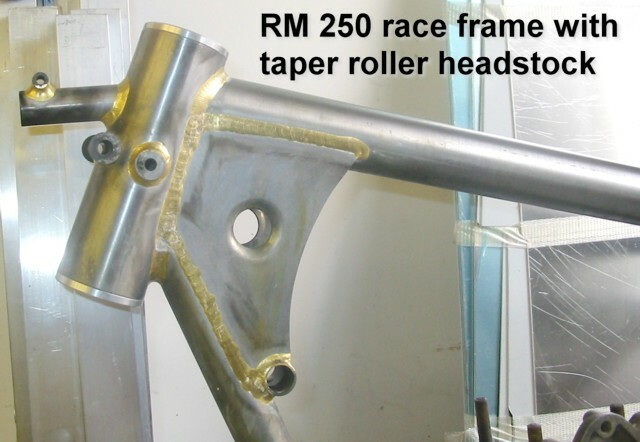 Comparison to a standard Tourist frame confirmed the head angle as being much steeper – now I had the excuse I needed to rectify the botched repair & at the same time strengthen the frame to the point better brakes could be specified. 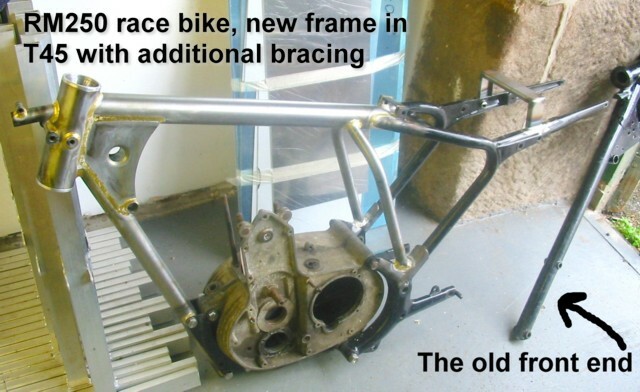 New modified frame…note the old headstock & get the tubing diameter!!! !The frame is now rebuilt with a much larger diameter headstock, to take taper roller bearings, which in turn allows a larger diameter top tube to give a much stiffer backbone. The front downtube is of standard diameter but stronger due to the T45 tubing used throughout the modification. 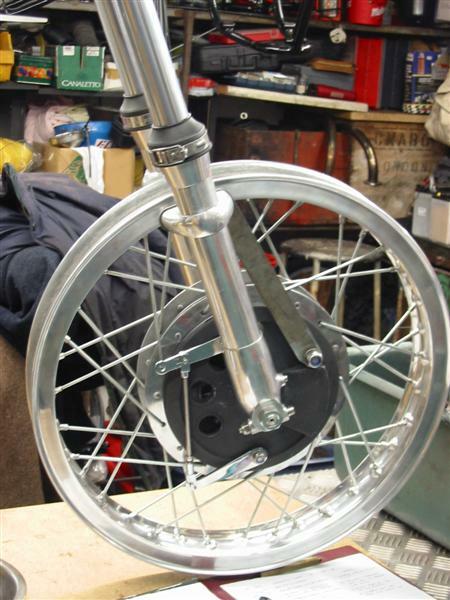 Additional bracing, as used on the works bikes, from top tube to swingarm cradle has been added. At the present time an extended swingarm is being checked over & an alloy tank being stretched slightly to fit the new frame. The inner cam tower was milled to gain clearance for the cam gear. The dowel lug also had a small shaving removed. Forks will be CGB Ceriani GPs & front brake a “dopple duplex” 180mm Grimeca. “Dopple duplex” is so much more elegant a description than “double sided twin leading shoe” don’t you think? Ceriani GP forks & Grimeca 4ls brakeThe forks have been fitted, CGB Ceriani GP replicas, & the Grimeca 180mm 4ls brake has been machined to fit. Not a very exotic , or light, brake but it should have the power needed to haul the bike down to a standstill. The hub has been laced to a Morad WM2 x 18″ rim & at present new torque arms are being lasered out incorporating cable stops for the brake cables. The front end has taken shape quite easily but the rear end is another story, the lack of a suitable hub has slowed down progress. It looks like a 125 Parilla hub will be modified to fit until a suitable 250 hub turns up. The engine has started to take shape. Parilla gear conversionLocked away in my “special parts” store was a gear drive cam conversion waiting for a suitable engine to turn up. The later 175 cases take the conversion without any problems at all. For reasons unknown to me the 250 cases are machined such that the intermediate spindle ends up too close to the double gear & stops them meshing. Also, the timing tower requires milling to allow clearance for the cam gear. The inner cam tower was milled to gain clearance for the cam gear. 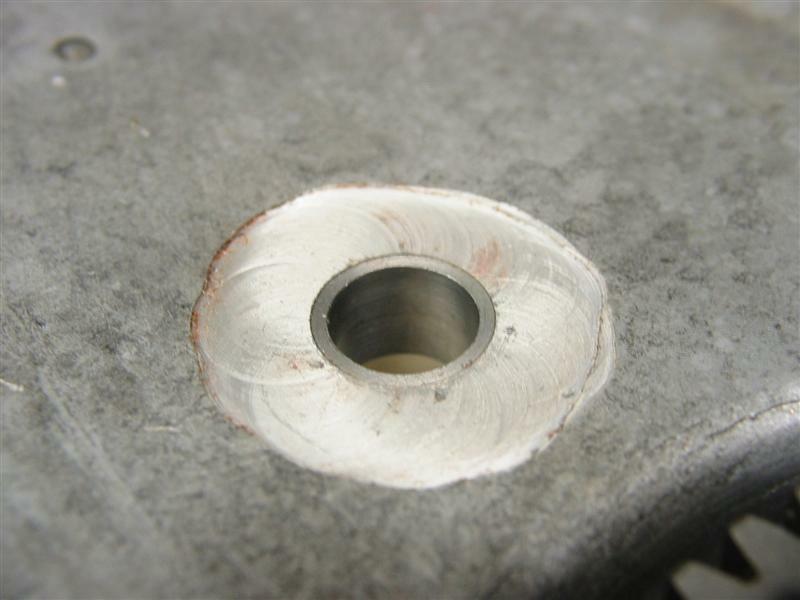 The dowel lug also had a small shaving removed. 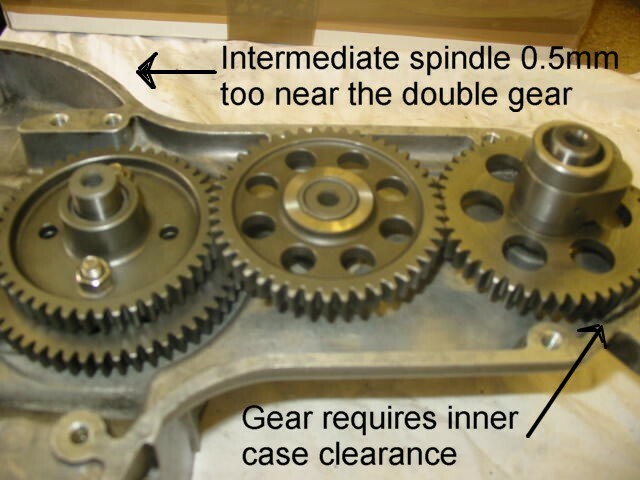 The original intermediate gear spindle location (used for securing the cam chain tensioner on a chain driven engine) was bored oversize to the correct centre for the spindle & then bushed back to size. Parillas original machining left something to be desired & the spot facing for the spindle location had to be redone inside, & behind, the cam tower. The finished article.Finally the gears mesh & we can move on to getting the cases together with a rebuilt crank & new rod in place. While the real engineering was attended to by an expert I got stuck into some less demanding work. 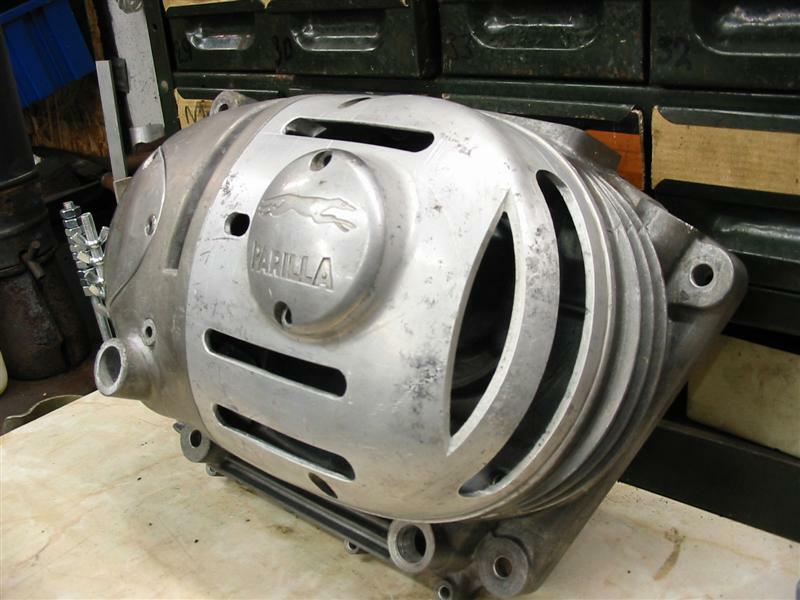 One aspect of the Parilla engine which works perfectly on the standard engine, but would be rather annoying on a race bike, is the fact that the gear selector, clutch release & kickstart mechanisms are mounted in the outer crankcase cover. Not a problem until one mounts a CDI unit on the crank & then timing alterations require the gearchange linkage, clutch cable etc to be removed before the cover can come off. 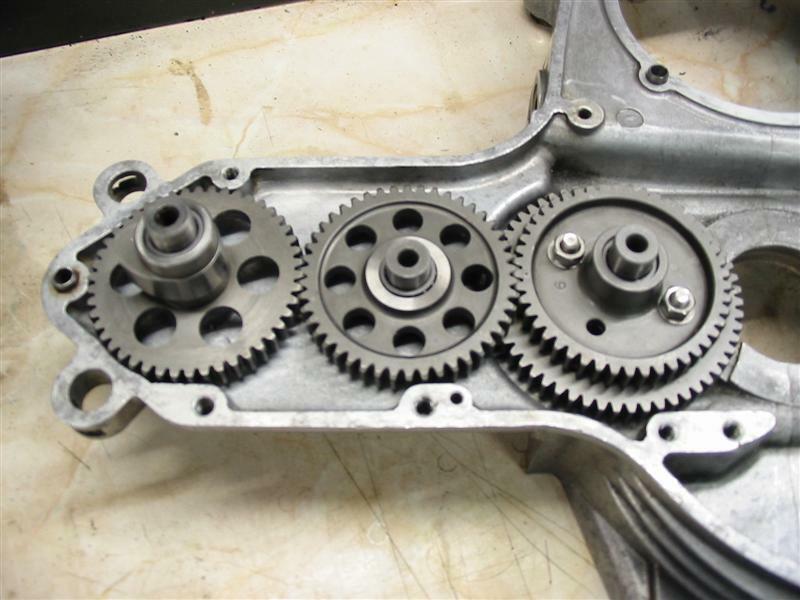 Also gearing changes involving the gearbox sprocket require the same. I had an outer cover which had cracked around the kickstart boss so it was a perfect candidate for modification. 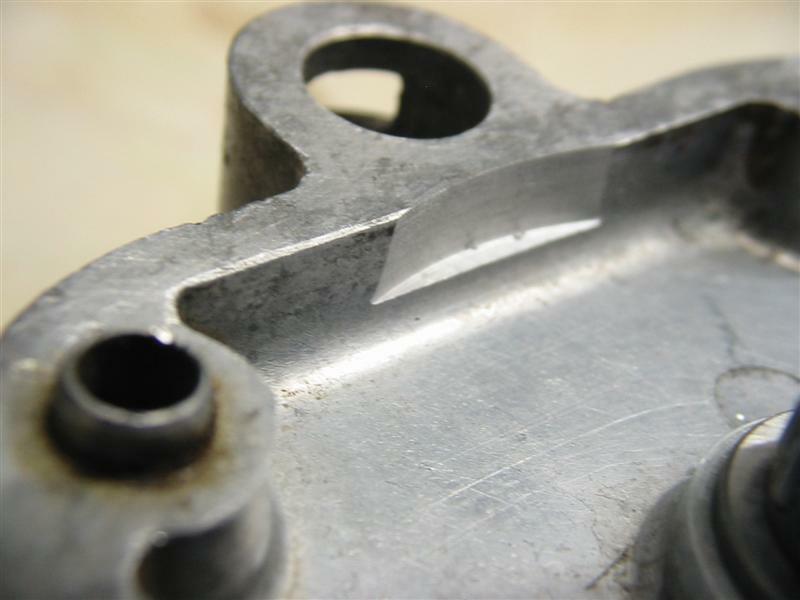 The case was sawn in two to make the front section independent of the rear half & also the broken kickstart boss was removed & modified to form a detachable sprocket cover which will keep the scrutineers happier than an open sprocket area ready to devour a finger. A bit of milling,drilling & filing later – plus a blob or two of Devcon – & I have a cover which will allow gearing & ignition work to take place leaving the gearchange & clutch mechanisms untouched. I took the opportunity to let some cooling air in too, the openings will need some mesh to keep stones out & hopefully it will always be dry when the bike is out….very likely in the UK? Hi-cam Moto Parillas in Trials?